We been planing our move for the last 3 months! and we have finally moved to our new office in Walton-le-Dale. It had been a mammoth task to move all the equipment and paper. I never new we have so much stuff! Our new building is over twice as large as before, to enable us to offer more services to our existing customers and to attract new customers in the area. Also joining us in March is Beverly, she will be our new Business Development Manager. Beverly will be working to help grow the business, manage customer exceptions and be there on the phone if customers have any enquires about design and printing. Along with the move we have recently won our largest printing contract with a major energy supplier, we are printing the letters for the smart meter campaign. For this new project which is for 3 years we have invested in a state-of-art Xerox Versant 180 digital press. With it’s advanced printing features and best in class printing quality this will allow us to access new customers in the Preston and wider area as well as printing the new major contract. So far the new press has impressed everyone with is output quality and speed of printing. Why not pop in to see us soon to see what we can do for you. 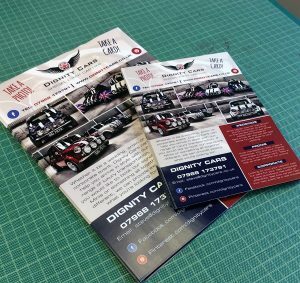 It’s been a very busy summer here at PWD Creative and we have lot’s of exciting print and design news to share with all our customers, new and old. We have a new radio advert with Preston’s CityBeat Station sponsoring their afternoon show. We also have a friendly new team member who now speaks to our new business sales, Catherine has a wealth of experience dealing with customers in a friendly and professional manner and is always ready to help with any queries you may have. More recently we been awarded the design work for KBA, they are one of the worlds best litho press manufacturers. They where impress wed with our design skill and speed of service creating new designs and helping them look at things a little differently than before. On a design and print side, we’ve just completed the Christmas leaflets for Ribble Stream Santa train ride, check out their website for more details. We’ve also been busy working with Houghton Tower on a range of banners for there up coming events. Finally we are working on some billboard designs for Rimmer’s Music, for Fender Guitars we are looking forward to seeing the up in Liverpool very soon. If you are looking for offers on the run up to Christmas we will have some deals on canvas wraps for Christmas gifts, but all printing and designing personalised Christmas cards. Our new LX2000E is Primera’s speediest and most advanced pigment inkjet label printer. Focused on the production of high-end labels of all shapes and sizes with an emphasis on low cost and quick turn around. It’s separate ink system are the key to producing fantastic labels for our customers, allowing for eye catching results and enabling high resolution prints or graphics, illustration, text and even photo’s amongst many others. They are perfectly suited for products that meet strict requirements such as Bath and shower products, freezer goods, cold drinks and much more! Durable, fast, efficient and overall save time and money for each of our customers. Over the early part of the summer PWD Creative have been working hard to offer some of the best printing prices in Preston & Lancashire. We’ve negotiate great deals on our paper supply so that we can continue to offer our customers some of the best prices in Preston. We have recently updated our businesses card specifications to now offer 450gsm silk art board as our Premium Business cards. From the initial trial printing we’ve had some outstanding responses from our customers on the quality and feel of these business cards. We’ve now added these to our new price list for 2016. See price brochure on our website for details. Did you you we do outdoor pvc banners on our eco-solvent wide format printer. We offer very competitive prices on PVC Banner in Preston, we even include the design in our great prices. All banner are glue hemmed and we use brass eyelets, we even include the plastic ties for your convenience.